How to use curses to draw to the terminal screen. While graphical user interfaces are very cool, not every program needs to run with a point-and-click interface. For example, the venerable vi editor ran in plain-text terminals long before the first GUI. The vi editor is one example of a screen-oriented program that draws in "text" mode, using a library called curses, which provides a set of programming interfaces to manipulate the terminal screen. The curses library originated in BSD UNIX, but Linux systems provide this functionality through the ncurses library. Creating programs that use curses is actually quite simple. In this article, I show an example program that leverages curses to draw to the terminal screen. Set three points that define a triangle. Randomly select a point anywhere (x,y). Randomly select one of the triangle's points. Set the new x,y to be the midpoint between the previous x,y and the triangle point. Let me walk through that program by way of explanation. First, the getrandom_int() is my own wrapper to the Linux getrandom() system call, but it's guaranteed to return a positive integer value. Otherwise, you should be able to identify the code lines that initialize and then iterate Sierpinski's Triangle, based on the above rules. Aside from that, let's look at the curses functions I used to draw the triangle on a terminal. The program then sets a few variables to define the three points that define a triangle. Note the use of LINES and COLS here, which were set by initscr(). These values tell the program how many lines and columns exist on the terminal. Screen coordinates start at zero, so the top-left of the screen is row 0, column 0. The bottom-right of the screen is row LINES - 1, column COLS - 1. To make this easy to remember, my program sets these values in the variables maxlines and maxcols, respectively. It's important to note that curses maintains a version of the screen in memory and updates the screen only when you ask it to. This provides greater performance, especially if you want to display a lot of text to the screen. This is because curses can update only those parts of the screen that changed since the last update. To cause curses to update the terminal screen, use the refresh() function. In my example program, I've chosen to update the screen after "drawing" each successive point in Sierpinski's Triangle. By doing so, users should be able to observe each iteration in the triangle. Running the triangle program on a standard 80x24 terminal is not very interesting. You just can't see much detail in Sierpinski's Triangle at that resolution. 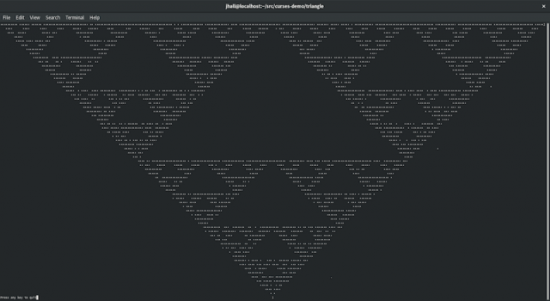 If you run a terminal window and set a very small font size, you can see the fractal nature of Sierpinski's Triangle more easily. On my system, the output looks like Figure 1. Despite the random nature of the iteration, every run of Sierpinski's Triangle will look pretty much the same. The only difference will be where the first few points are drawn to the screen. In this example, you can see the single dot that starts the triangle, near point 1. It looks like the program picked point 2 next, and you can see the asterisk halfway between the dot and the "2". And it looks like the program randomly picked point 2 for the next random number, because you can see the asterisk halfway between the first asterisk and the "2". From there, it's impossible to tell how the triangle was drawn, because all of the successive dots fall within the triangle area. This program is a simple example of how to use the curses functions to draw characters to the screen. You can do so much more with curses, depending on what you need your program to do. In a follow up article, I will show how to use curses to allow the user to interact with the screen. If you are interested in getting a head start with curses, I encourage you to read Pradeep Padala's "NCURSES Programming HOWTO", at the Linux Documentation Project.